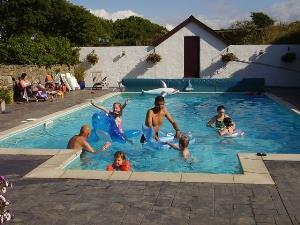 Trenewydd Farm Cottages01239 612 370work Self-cateringEnjoy our seasonal, outdoor, heated swimming pool and private hot tub spas which are available all year with two out of seven holiday cottages and B&B. Cottages range in size from our romantic cottage for two to our largest cottage sleeping 13 which is ideal for extended families or groups. Trenewydd Farm Cottages are set in a beautiful rural location near the North Pembrokeshire coast with the award winning Poppit Sands only 2.5 miles away & many nearby beaches and coves provide regular sightings of seals & dolphins - the highlight or many holidays. The fully equipped & exceptionally well maintained cottages, are set in beautiful gardens with swimming pool, hot tub spas, BBQ area, childrens' play areas including a football field and pets to cuddle. Dogs are welcome to stay in 3 out of 7 of the cottages - the Farmhouse has an enclosed garden, Oak Cottage has a private hot tub spa and Cherry Cottage. The area offers a wide variety of scenery & attractions, with opportunities for coastal & inland walking, outdoor activities, bird-watching, fishing, golfing, horse-riding, boat trips etc. The area is also rich in historic buildings, gardens and craft specialists offering something for everyone. Ideal central location for visiting Pembrokeshire National Park, Cardigan Bay, Snowdonia National Park and the Brecon |Beacons National Park. Many guests stay for 2 weeks and say they have still not seen everything! We are open all year for Week or Short breaks. EASTER DISCOUNTS on 7 cottages or B&B. See www.cottages-wales.com/special-offers for full details of cottages including only one left with hot tub spa. Dog/child friendly. Also, book your 2019 break now for £50 off week or £25 off short break. Enjoy our seasonal, outdoor, heated swimming pool and private hot tub spas which are available all year with two out of seven holiday cottages and B&B. Cottages range in size from our romantic cottage for two to our largest cottage sleeping 13 which is ideal for extended families or groups. Seasonal heated outdoor swimming pool, 2 private luxury Hot Tub Spas, BBQ area, playing field with football goal posts, play area with swings, see-saw and ride-on toys, pets for children to feed and cuddle. Near dolphins, beaches, Pembrokeshire Coastal Path, outdoor activities and family friendly attractions. Three dog friendly cottages, one with enclosed garden. Four dog-free cottages. Ideal for couples, families and groups. A warm welcome awaits. Children welcome from any age. By Car: From Cardigan take the Fishguard road for 2 miles. Turn right for Moylegrove but stay on this country road for just 1 mile, do not take any turnings off.